Algivon Manuka Alginate is a gauze bandage with 100% Manuka honey. Honey has several properties that have a supportive and caring effect on the damaged skin. Manuka Alginate is a viscose gauze bandage that is drenched with 100% Manuka honey. This bandage contains alginate fibres that ensure the continuous release of small amounts of honey. This bandage is very pliable and soft making it suitable for sinuses/cavities. In addition, the bandage is absorbent, making it good for more moist wounds. The honey remains in the bandage for a while. For all types of wounds, especially: sores, surgery wounds, burns and infected wounds. Do not use this bandage if your pet is allergic to bee poison. For diabetes patients we recommend you monitor the glucose level, even though the honey is not absorbed into the bloodstream. Apply the gauze to the wound. For larger wounds, you can place multiple bandages next to each other. You can also cut the gauze bandage to size with scissors. A second bandage can be applied next. Keep the bandage at room temperature. If the bandage has become hard, you can warm it between your hands shortly before use. If it has become too liquid, you can place it in the fridge for a couple of minutes. 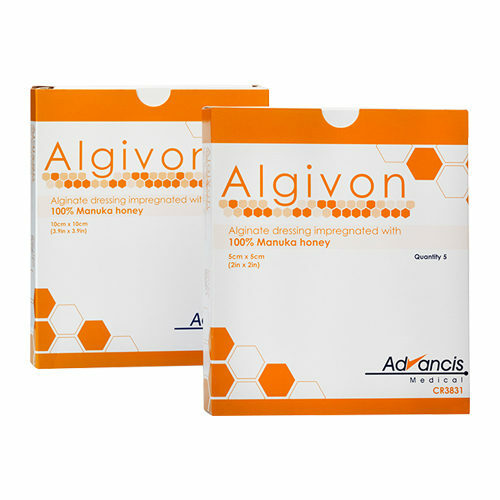 Have you used Algivon Manuka Alginate Bandage before? Let us know what you think about this product.